January 2, 2019 at 8:30p.m. The United Autoworkers Union has filed a lawsuit against General Motors, saying the automaker continues using temporary workers at its plant in Fort Wayne, Ind. instead of filling those jobs with some of the 690 union members who have been laid off from the GM Assembly Plant in Lordstown. The United Autoworkers Union has filed a lawsuit against General Motors, saying the automaker continues using temporary workers at its plant in Fort Wayne, Ind. instead of filling those jobs with some of the 690 "seniority employee" union members who have been laid off from the GM Assembly Plant here. The civil lawsuit, filed Wednesday in U.S. District Court in Youngstown, claims that GM is in violation of a memorandum of understanding with the UAW allowing GM to hire temporary employees from May 31 through Aug. 31, 2018, to support the launch of a new pickup truck at the Fort Wayne Assembly Plant. Alleging breach of contract, the UAW is asking the court to order GM to stop using the temporary employees in Fort Wayne and transfer union members to the plant. According to the suit, obtained by The Vindicator’s broadcast partner 21-WFMJ-TV, GM continued the use the temporary workers even though the union rejected a request to extend the temporary employment until the end of February this year. The union said it did offer to allow the temporary employees to work until the end of December if GM would agree to submit a plan to eliminate the temporary group by then and transfer senior union members to Fort Wayne. The UAW says GM responded with a plan that wouldn’t eliminate the temporary workers until May 2019. The union rejected the proposal and gave GM until the end of this past November to replace the temporary workers with UAW members. The lawsuit says GM continues to use temporary workers in Fort Wayne while many of the 690 seniority employees laid off in Lordstown have applied for jobs there. GM has not yet filed a response to the UAW lawsuit. 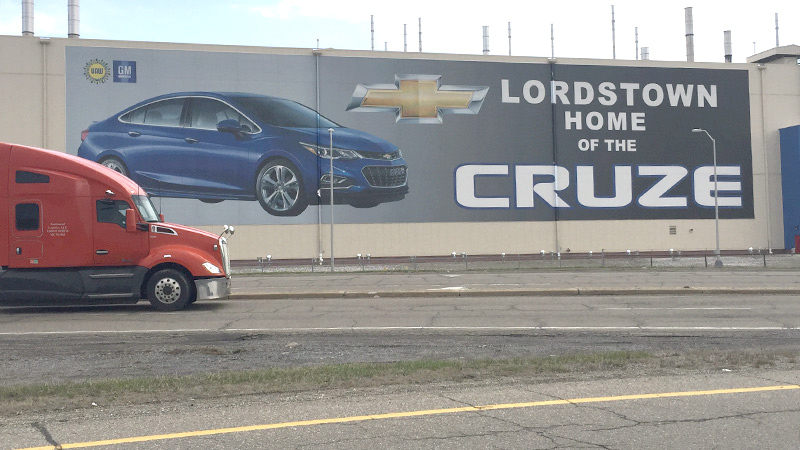 General Motors, which already cut two shifts at its Lordstown operation, announced last year that it would stop making the Chevrolet Cruze at the plant this coming March and had no plans to replace production with another vehicle. Closure of the plant would mean the loss of another 1,600 jobs. Attempts to reach Dave Green, president of UAW Local 1112 at the GM Lordstown Complex, for comment were unsuccessful. In addition to Lordstown, GM said it intended to close two more plants by the end of this year. Local UAW leaders have signaled their desire to make those plant closings an issue in negotiations for a new labor agreement which begin this fall. January 2, 2019 8:03 p.m.
January 8, 2019 9:16 a.m.
October 5, 2007 5:31 p.m.